It was a funny little town in Hertfordshire, hardly big enough to be called a town, but it boasted of a charter, granted to it to hold every year in early September, a statute hiring fair. The people waiting to be hired would assemble at the top of the old High Street, hoping someone would think they were willing and fit enough to be able to work for them. This old High Street seemed to form the background of the small town known as Hemel Hempstead. From the bottom of this street walking up, one would pass many public houses, beginning with the Boot on your right, then on your left down an alley was the Half Moon, followed a bit further up by the White Hart, then on the right the Rose and Crown. Further on was the Swan, a little further the Kings Arms, then the Bell. The last two on the right were the Sun and, at the end, with the junction of the bottom of a street with the very quaint name of Cherry Bounce, stood the Royal Oak, which was once said to have been some kind of a prison (see end). Opposite on the other side of the road was a cast iron public water pump made and erected by Cranstones, then down some steps or a slope was Watsons (the corn dealer) then the Brewers Arms. These public houses seemed to have emerged after the clamping down on the malt houses where ordinary people had been making strong ale and gin. Halfway up on the right and set slightly back between the Rose and Crown and the Swan was an engineering and iron foundry known as Cranstones. On market days it also included a cattle market on the land behind the Rose and Crown, but the market for wares was on the market square beside the Town Hall and in front of Saint Mary’s Church, the bells of which used to play chimes, but ceased because the residents complained. Hundreds of people would be walking backwards and forwards looking very jolly. It all seemed like a big holiday, amongst all these people jostling together, when suddenly a herd of cows or a drove of sheep would come out of the side opening, being driven home by their new owners, also cart loads of animals being taken away. Such was the scene on market day on every Thursday. 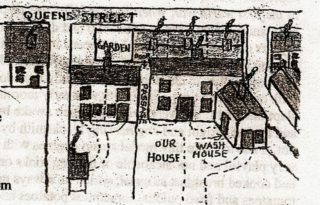 At the bottom of the old High Street was a street called Queens Street (once Saffron Lane), different altogether from the High Street. At this junction was the large, modern (1884) and impressive building of Lloyds Bank (was Grovers). Although Queens Street did have four public houses and a corn dealer shop, the corn dealer’s was first no. 1, owned by Thomas Denny; the Queens Head no.2; the Swan and Trout no 4; the White Lion, the Oak. A bit further on was Highfield Lane, which had a very large high bridge, over which our local train ran. Queens Street was populated with many families most of whom lived out their lives in tiny cottages. Quite a few of these were only two up and two down, with a toilet further down the garden path, some of which were shared between two families. Every meal, every wash, every bath, had to be in the one room. The other room or backhouse stored the coal and was also used for drying washing when the weather was wet. Some houses were larger, but some even smaller. There was no bathroom but there were public hot and cold baths at the waterworks in Marlowes. The only light was from paraffin lamps or candles. It also had a slaughter house (Keens); an infants school; a hand wash laundry; a farm called Handpost farm, a field of which was commandeered for army use during the war. There was a church called St Paul’s; at the very top was the workhouse. It also had the police station and jail at one time, until 1860. Opposite was a short road called the Broadway in which was the local solicitor, Lieutenant Colonel Lovel Smeathman, and the fire station, and at the end of which was the local stagecoach post house. In the middle of the road at this junction was a public stone water pump. Opposite the High Street was Alexandra Road in which was the local newspaper and printing works and a bit further up was the post office, later to become the fire station. It was in 8 Queens Street in 1912 on the 23rd of June that l, Gertrude Lavinia Ansell, was born. The family l came to were not so poor as they once had been, for by this time the eldest four daughters were at work and bringing in money. The other two were boys whose ages were eight years and nearly 11 years. I also had a half brother of 22 years old, William ]ohn Carrington, born September 1890, who was later a soldier (Lance Corporal, London Regiment, Queen Victoria’s Rifles) in the First World War, when he was killed and died on 21st January 1917. Apparently there had also been another boy born in 1905 who had died at the age of 18 months (1906/7), and would have been seven years old had he lived. So I supposed my coming was a bit of a shock. Nevertheless it appears my coming brought much pleasure to my brothers and sisters. My eldest sister was the one who was to help my mother in childbirth, with the lady next door (Mrs Dyer) to keep an eye on things until the midwife came. The time of my birth was early morning. I would think not many of the family would have slept that night, but were evidently much awake by breakfast time. My father was a big hefty man, and a wheelwright and engineering blacksmith by trade who always looked very stern but really was not. I used to make tiny model steam engines with him (open turbine/steamjet). He was sometimes very playful and not incapable of playing tricks on the family. That morning as head of the family he had cooked breakfast, which he always made into a very large meal with bacon and sausages, tomatoes and fried onions, and sometimes potatoes and cabbage left over from lunch were fried up. This combination and was called bubble and squeak, apparently from the way it behaved in the pan. black boy instead of a girl”. Mother was angry for a while, then she laughed and said “where is the baby?”. “Not to worry” said father, “she is all right in the other room”. But downstairs his reception was less laughable as the family thought it was a poor joke. But there, that was the kind of man he was. As the days passed by there seemed to be a sense of uneasiness with the talk about a pending war. My half brother had joined the army and was away at Bedford. Then in August 1914 it was decided father should take mother and myself to stay at my aunt’s for a while. My aunt and her husband were housekeeper and butler in a large house on Wimbledon Common, and they themselves were given accommodation in the lodge. I still remember the great big bedroom where I was supposed to sleep, but spent the rest of the week in my mother and father’s bed. What with the great big windows and all the white paintwork, everything seemed so large, I really felt very frightened. Fortunately there was a boy cousin there and, although he was quite a bit older, seemed to understand the fears of a little two year old girl. He would take me down to the stables to see the horses and the carriages. He even rigged up a telephone with two tins and a long piece of string, saying before he went to the other end “I am going to speak into this tin and I shall be a long way off, so you must listen like this”, putting the tin to his ear. “If you hear me, you say into your tin ‘yes’ - don’t shout just say yes”. He explained the volume I was to use. And then he went off and everything turned out as he had planned. We spent a most enjoyable time together that morning. I found him to be a lovely boy who was so considerate to me – who must have been a very tiny tot to amuse. He was about nine years old and the master and mistress of the big house were very taken with him. They paid for his education and he was sent to prep school with their own boys. So the holiday soon ended and we had to make the journey home. This would be by train in those days as there were no coaches or motors for public transport- only horse and carriage existed. It was to be a real nightmare getting home; war was about to be declared and the trains had been commandeered to move the troops. It would seem that each train that came was full and did not stop. I suppose eventually we were able to get on a train, but we were a long long time arriving home. It was a good thing auntie had given us so much food to eat on the way home. War started soon afterwards and we received news that my half brother William had been sent to France. Food began to be in short supply and soup kitchens were set up. The shop that became a soup kitchen was the little old shop that was the baker’s shop that stands at the beginning of the High Street and looks to Queens Street. The garden was very big and home for my pet bantam. My mother (once a rag sorter at Frogmore Mill) was busy making jam from the many fruit trees that were in our garden, which had two cooking apple trees, three blenheim apples, one william pear, one conference pear, one codling apple, one cherry tree, two victoria plums, and one tree with very large plums which were nearly black when ripe. There was a golden plum tree also. One corner of the garden held a collection of four rows of gooseberry bushes, while down the garden path was red and blackcurrant bushes, with six more current bushes on the other side of the garden. There was red and green rhubarb in large beds and also beds of mint of two kinds – spearmint and peppermint. With father planting out potatoes and greens, onions and shallots with lettuces and radishes, there was plenty of bottling of anything that could not be eaten right away, and also if you could prove you were making jam etc. you were allowed extra sugar. So our store of food greatly increased during the summer and autumn. It was very fortunate that the wash house, which joined on to the house had a large fireplace which shared the chimney with the copper. This was used for making jam. The house itself was rather peculiar in the fact that three houses on the street overlapped our house. It had only one door opening onto the street, even that was set back behind a small garden belonging to one of the overlapping houses. Its back view was as a usual looking house with a door in between two sets of windows. It had one fairly large living room and one room called the front room. Up the boxed-in stairway was one very large bedroom and two more bedrooms which were smaller. All cooking was done in the living room. In wet weather the room also became a drying room with sheets hanging like tents from lines which criss-crossed the ceiling, while round the fire a couple of clothes horses further festooned with clothes to be dried, and even after ironing the clothes horses and lines were filled with clothes airing. There were five rooms in the house. The dining room table was very large and had been made by my father. A large tread mill wheel that was turned by a man walking in it had been dismantled out near Water End and my father had begged for some of the wood. This was granted but of course had to be transported by himself. It took many journeys too, because my father although very strong could only carry so much. From this emerged the huge dining table whose top was scrubbed so clean and white, as its other use was the preparation of food, pastry and rolling etc. There was also a form which the boys had when having company to sit at another table. My father (Percy) said the wood came from the water wheel of Nokes Mill at Water End, where his father had made and installed a part metal water wheel. This was the first of six mills on the river. The afford said boys form was usually kept in the niche beside the fireplace. It was on this form beside the fireplace that my mother sat usually with me beside her during thunderstorms. I well remember the feeling of awe and fright as my mother prayed aloud to God that he might have mercy on us and protect us from the storm. Inside the cupboard under the stairs the dog would be thumping against the stairs, the noise which to me made the storm that much more frightening. I have never really overcome my fear of storms, but always remember God is in control, and I can call on him for strength. My mother died when I was 18, aged 58 on January 27th 1930, and my Farther died when I was 11, aged 53 in 1923. Although there was no public electric supply until 1922, there was a Kinema in Marlowes in 1913 called the Princess Theatre. It only had a shelf stage and provision for a piano. The piano was used for background music as the films were silent. The electric was made at the rear with the use of a gas engine. There had been a public gas supply since 1835, when the gas works was in Bury Road, it later moved in 1894 and became Hemel Hempstead District Gas Co. It seems as if all power was derived from water, steam or gas. But there was a derelict ruin of a windmill, 1915, viewed from the Midland Road. The Gazette works moved to Bury Mill End just before 1920, and that at that time was powered by a gas engine, but soon had public electric power. Hemel was noted for its high-quality watercress of which there was an abundance; it was probably the biggest supplier to London. There was a tremendous amount of watercress from Water End to Two Waters. The water came from Artesian wells, so the water was purer and at a constant temperature. There was an open air swimming bath, the water flowing in and out from the canal, it was hidden by trees and was opposite St John’s Church in Boxmoor. The Royal Oak proprietor was Joseph Lunworth. He was the master of the House of Correction and it was expected for him (them) to provide the premises, so he used the Royal Oak. The House of Correction was to reform vagrants, and where people were held for wrongdoings or held until they were taken to court at Hertfordshire. Apparently there was in the past (1830) a device called the cage where people were placed for misdemeanors.